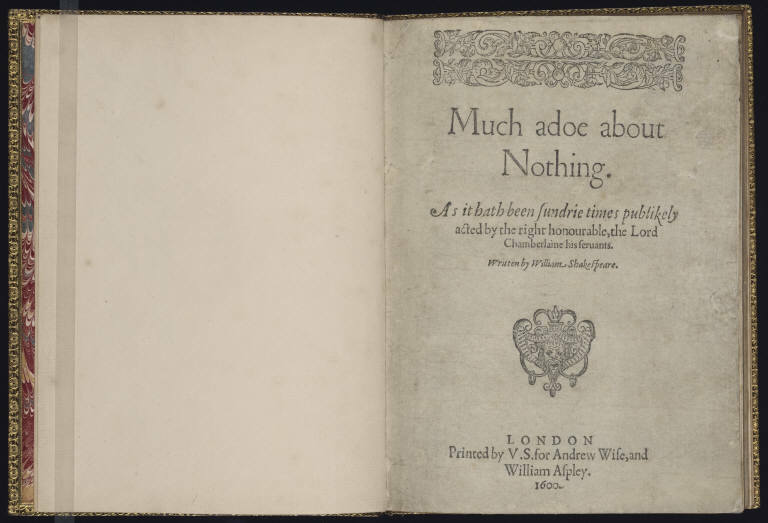 Shakespeare’s actors enjoyed a celebrity status that was in many ways not so different from the renown enjoyed by actors today. Names like Edward Alleyn, Richard Burbage, and William Sly were recognizable among London’s theatergoers for the gestures and verve they brought to their roles. So recognizable were these actors, and so distinctive were their mannerisms, that dramatists frequently would write the characters of their plays with particular players in mind. The close connection between writers and actors at this time—especially pronounced when the actors and writers worked for the same theater company—made this practice of writing-for-actors more common than it is even today. Con. Mary sir we say, we are none. Kemp. A marvelous witty fellowe I assure you, but I will go about with him: come you hither sirra, a word in your ear sir, I say to you it is thought you are false knaves. Bor. Sir, I say to you, we are none. Kemp. Wel, stand aside, fore God they are both in a tale: have you writ downe, that they are none? The lines are familiar enough, but the names have been altered. Who is Kemp? In the Folio version, the speech prefix of Kemp would be changed to Dogberry, the name we now associate with the unwittingly helpful fool of Shakespeare’s comedy, and elsewhere in the quarto version—Dogberry’s first appearance, for instance—the prefix remains either “Dog” or “Dogberry.” So why, then, the change to Kemp later in the quarto? The change would seem to count for more than a typesetter falling asleep at the wheel. 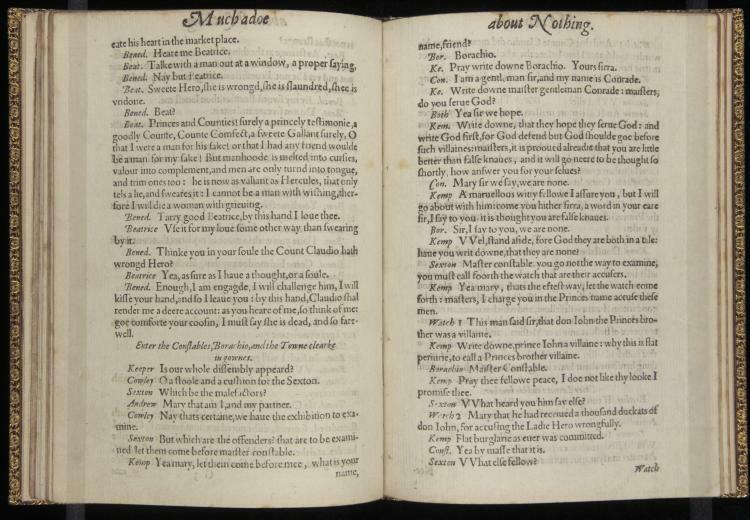 William Kempe, the “Kemp” evoked in the quarto’s speech prefixes, was an actor well known in the 1590s for the comedy he brought to his roles. Clownish and foolish characters like Costard, probably, in Love’s Labours Lost and Bottom in Midsummer Nights Dream earned Kempe a comedic reputation that was strong enough to stick with him beyond the theater. When he left the Lord Chamberlain’s men, around 1599—due, some evidence suggests, to conflicts between Kempe and other shareholders in the company—he was well-known enough to think he could take his famous jigging on the road. His self-proclaimed “Nine Days Wonder” brought him by foot from London to Norwich, and he morris danced the whole way. Could the change in speech prefixes of Dogberry, then, have been an attempt to capitalize on Kempe’s comic celebrity?